Picking up this case of 1,000 rounds (20 boxes with 50 rounds each) of .380 ACP ammunition from Sellier & Bellot is a great way to practice with your carry pistol while keeping your costs down. 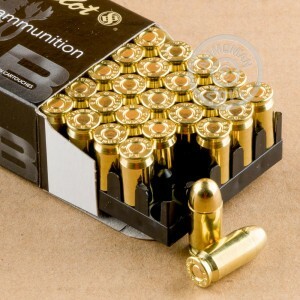 Suitable for a variety of .380 Auto pistols such as the Ruger LCP, Colt Mustang, Walther PP, and others, this ammo uses a 92 grain full metal jacket bullet, non-corrosive Boxer primers, and reloadable brass cases. 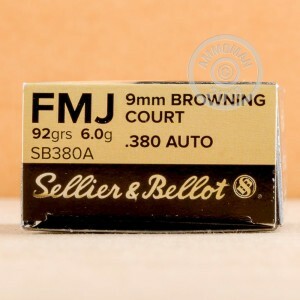 Sellier & Bellot is a popular brand of ammunition made in the Czech Republic. The company has enjoyed great success in the global ammo market since undergoing privatization after the end of the Cold War. AmmoMan.com guarantees free shipping for all orders over $99. This increases transparency for customers by making the list price the actual price paid, with no fees added at checkout. I ordered 1000 rounds and have gone through 900. Ammo works great! This is a wonderful company to do business with, with great prices, top notch service, and very fast shipping for a very reasonable cost.